Thinking about running a half marathon or even a full marathon this fall? Here are some things to consider before you register for one of these races! The location: The location of the race is a very important factor to consider. How far are you willing to travel? Keep in mind: early starts and how you'll feel post-race. For example, you might not want to drive three hours home after running 13.1 miles. Who do you want there with you? If you want friends and family cheering for you on the sidelines, you might want to consider a race closer to home. In general, traveling is stressful, so if it's your first race, you may want to consider staying local to avoid any additional worries. 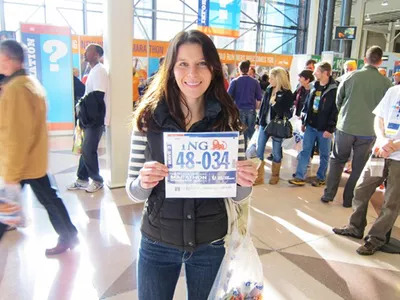 The course: If you're running your very first half marathon, the course can totally make or break your experience. Tip: check the elevation profile of the course and consider how it compares to your hometown route. A course full of rolling hills, for example, won't be very fun if the majority of your training took place on flat terrain. Additionally, think about the type of experience you want out on the course. Do you prefer a scenic course along the ocean or would the streets of a city be more appealing to you? Do lots of spectators motivate you or stress you out? The course is a key factor in selecting a race, so be sure to think long and hard about this aspect. The cost: The cost of a race registration for a half marathon can range from $30 to $100, and the longer you wait to register, the more expensive it is. In addition to the cost of registration, you should also consider travel costs. Are you driving or will you need to fly? Where will you stay? A hotel or can you bunk up with family or friends? Travel expenses add up quickly, so before signing up for a fall race, sit down and hash out all of the travel and related costs first. The reviews: Especially for larger races, you can read a variety of reviews online to get a feel for the race and what it is all about before your sign up for it. Of course, all race websites will say their race is the best, so read real, honest reviews from runners online. A simple web search (race name + review) will turn up all sorts of information. Additionally, running blogs have a plethora of race recaps on them. For example, here's one for the Los Angeles Marathon from Run Eat Repeat.